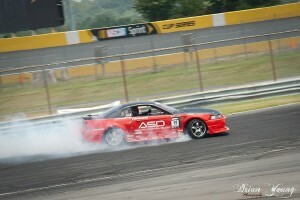 As the 2011 Summer heated up in the South, DVM’s drifting schedule was burning-hot with 3-competitions in only 6 weeks. Luckily for the team, all of the events were in their home city of Charlotte, NC so travel time was at a minimum. 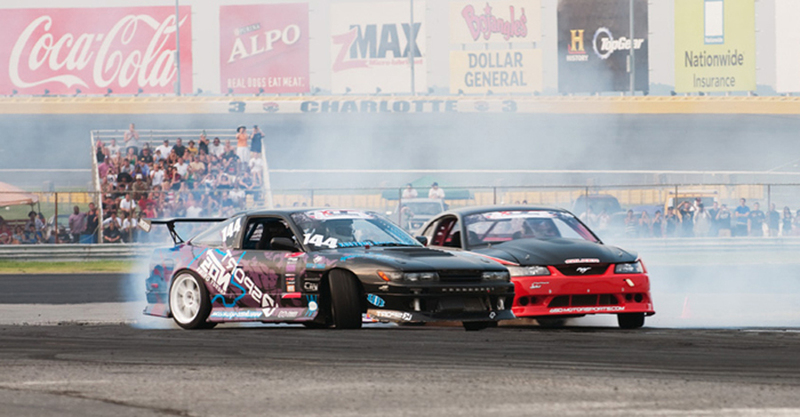 On July 2 the Xtreme Drift Circuit rolled into the Charlotte Motor Speedway for the first time. The track at CMS is a bit on the tricky side with a long gap between turns 1 & 2 and then some tight 90 & 180 degree turns that follow. “It’s great to have so many events at home this season. It’s given us an opportunity to have a lot of friends at the track that normally don’t get to see us live.” Doug Van Den Brink said. 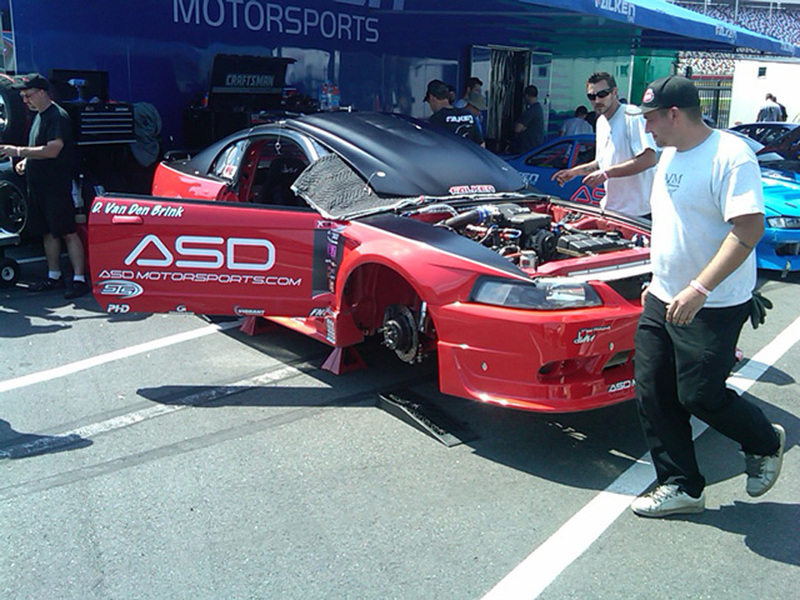 7-days later our DVM crew was back in action just across the street from CMS at the “parking lot” track of zMax Dragway. During the week, they made a few changes to the turbo combination that they hoped would help the car pick-up speed a bit quicker. The course at zMax is known for being fast and a bit slippery. As with most cities in the South, temps during the event soared to well over 100-degrees putting DV’s Mustang in-car temps in the 140* range. “Yeah, it’s a bit warm out there.” Doug said. “But the car’s running well, our Falken tires are gripping as good, if not better than any tire out there and I’m feeling good.” Doug and his Mustang would eventually go on to qualify 3rd putting the team in good shape when time for the competition. Doug moved through the Top-16 round pretty easily and then struggled to get past Jason Jiovani thanks to some “very interesting” calls by the Judges. 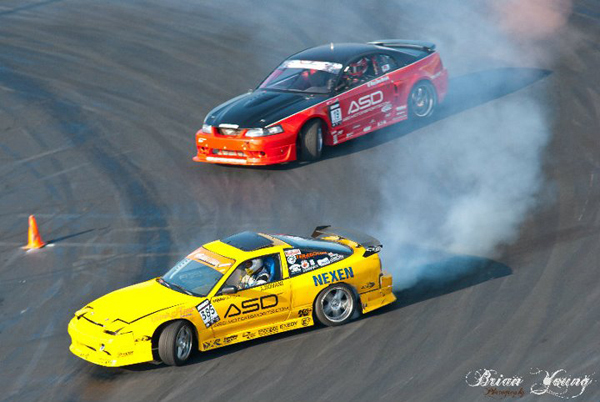 He then went up against Chris Ward in the Top-4 and somehow lost the round even though the Nissan driver used an inside-line to catch-up to Doug in the large “sweeper” down at the far end of the track away from the Judges eyes. Doug would then go up against Jodin Lejeune in the Consolation round. The Infinity driver was struggling to keep his car on line so DV easily moved past him to take 3rd-place overall honors for the event. For their next event Doug and his boys were back over at CMS for the 4th round of the Formula D Pro-Am presented by Streetwise Drift. As customary in the South in the Summer time, the day was hot, crazy-humid and threatening rain most of the day. Recounting lessons learned earlier in the month, the DVM crew made more changes to their rear suspension making the car more predictable for DV to drive. “The car is definitely better than it was last time. It’s still a challenging track but I think I have a better handle on it this time around.” DV said after the 2nd practice session. After all the other competitors made their runs, Doug would end up 2nd, securing him a very good chance in the competition. “I’m really happy with our qualifying result.” Van Den Brink said. “I really wanted that first lap but I just charged it a little too hard and it bit me. On the second lap I had to make dead-sure I got us in the show so I naturally dialed-it-back a notch and while it was good, it clearly wasn’t my best lap. That said, 2nd is great. I’m happy for the guys and I think we’re in really good shape as long as the rain holds off,” he continued. After an hour and a half of deluge the rains gave up and a drivers meeting was called to discuss the situation. It didn’t take long for the drivers to unanimously agree to get back out there and finish what they had started. After all, “who hasn’t drifted in the rain before?” as one driver put it. 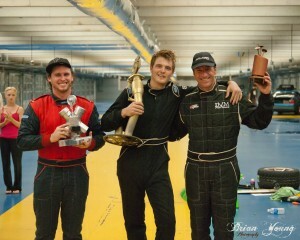 Doug said after the event, “Without question, I’m very happy with 3rd place and very grateful to have won it. Add to that, it’s way-better than finishing 4th! But I can’t help but feel that this is “one that got away” from us. All the guys did an awesome job on the car. I’m really excited that Bobby and Ben from CIN came to give us a hand as it’s always great to have them around. I think we’ve got the car headed in the right direction as far as dry set up, so I’m really looking forward to the rest of the season,” he concluded.